I’ve always had a natural disposition to curiosity, that endlessly push me to explore the surroundings of any area that I’ve visited. Nature in all its forms has always fascinated me with its changing scenes, fantastic colors, perfect designs and shapes, powerful sounds, profound silences and beautiful lights. When light meets nature the result is magnificent. Caught by the desire to discover more and more, I have traveled all around the world, preferring the wilderness: the high mountains, the silent forests, the dazzling deserts. I was desirous to see the planet in his incredible and infinite variety. With the passing of time I felt the need to share these experiences with images. Vivid images impressed in my mind, that maybe cannot do justice to the beautiful show in front of me. But only pictures taken with the mind’s eye can involve the viewer, causing those emotions that still push me to continue my visual research. 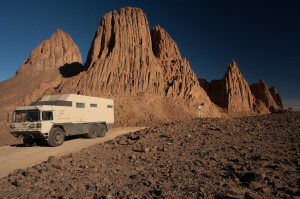 In November 2012, after two years of preparation and hard work, my truck MAN Kat1 A1 was released as a converted camper off-road. It was a former minelayer of the Belgian army, purchased used at the end of his 20 years of service, and finally ready to start a new journey. I decided to test it with a group of friends, so we left for Algeria, a wonderful country in which I have been for 3 times.